Journalists, you are unfortunately out of luck. I don’t know if anyone has broken it to you yet, but the traditional black and white news release is on its way out. Individuals are interacting with media differently than they have before. Social media has taken the world by storm. It has revolutionized the way we share content, interact with one another, and gather news. 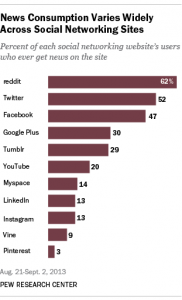 54% of adults use LinkedIn as their source for news. Photo Courtesy of: Pew Research Journalism Project. According to a 2013 Pew Research Journalism Project study, 54% of adults who use social networks for their news use Twitter as their source, with LinkedIn coming in second with 51% of adults. This social trend in consuming news has caused the news release to evolve. 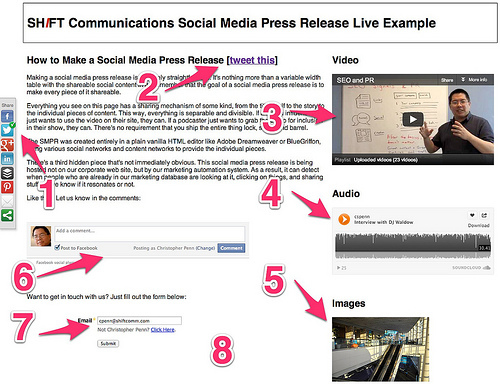 The Social Media Press Release (SMR) is the press release of the 21st Century. Robin Good defined a SMR as “an evolved approach to preparing press release characterized by a multimedial and facts-oriented approach.” The typical social media press release integrates video clips, bookmarks, citations, blog posts, multiple links and resources allowing the news editor to pick and select individual info items that may best serve his interest, editorial style and audience. I feel like the key difference between a traditional news release, pitched to the media, is the amount of multimedia and interactivity present. Traditional news releases tend to be just straight text, whereas, SMRs on the other hand, tend to have less text and incorporate more video, audio, images etc. Many of us have heard the phrase, “Content is king.” I encourage all of you to add one word before that phrase, “Visual content is king.” After all, a picture is worth a thousand words. What does a SMR include? How should a SMR be structured? Shift Communications provides one example. Shift Communications’ SMR Template 2.0. Photo Courtesy of Shift Communications. Whether its a SMR, or a traditional press release, organizations needs to choose the format that is going to resonate the most with their publics. If their publics aren’t on social media, a traditional press release may seem a more logical route. On the other hand, if you are trying to target a particular niche of millennials, using television, radio, and the newspaper may not be the best idea. What are your opinions of the SMR? In your opinion, what companies use it well and which ones don’t?